Call of the Wolf is chapter five in What Animals Can Teach Us about Spirituality: Inspiring Lessons of Wild & Tame Creatures. 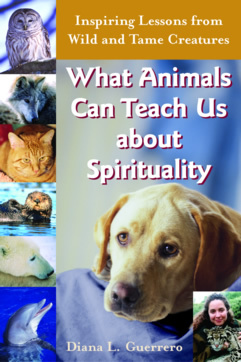 It is a purely canine discourse where wolves and domestic dogs lead the way through lessons of surrender, confession, acceptance, listening and tuning into nature. "The lone howl reverberated through the compound. It was answered first by the other wolves, then by the coyotes, and next by an assortment of animals. In response to the wolf's call, lions, tigers, monkeys, and chimps all joined together in a wild symphony. It lifted in a crescendo and then dropped in a diminuendo. Over my lifetime I have experienced many such concertos orchestrated by wolves. There is something about the call of the wolf that touches a deep chord within me. I always stop what I am doing when the animal choir begins, and sometimes I too even join in and howl. The subject of myths and mysticism, the wolf is a creature who sparked fear and hatred in the hearts of humans, generated stories and folklore, and ultimately emerged as a resilient icon of our link to nature despite opposition from humankind along the way. The embers or erroneous accusations and persecution of wolves have been extinguished and replaced by respect and awe for their virtuous examples of family life and ability for complex communication..."